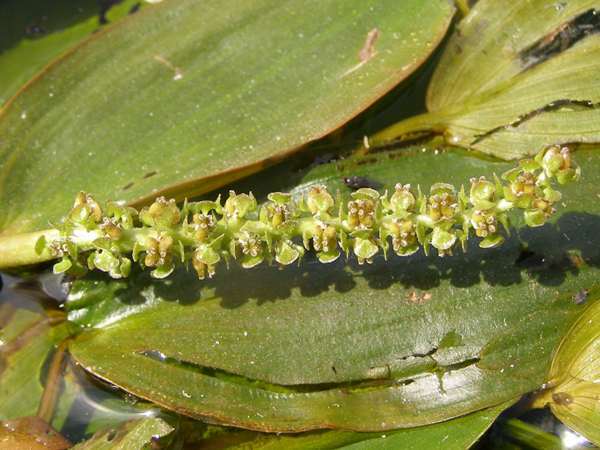 Broad-leaved Pondweed is widespread and common throughout the UK and Ireland. These submerged perennial weeds aren't always easy to identify, because the leaf shape varies according to the flow of water. The submerged leaves are narrower than the floating leaves. The sample pictured here is from a small pool where there is very little water movement. 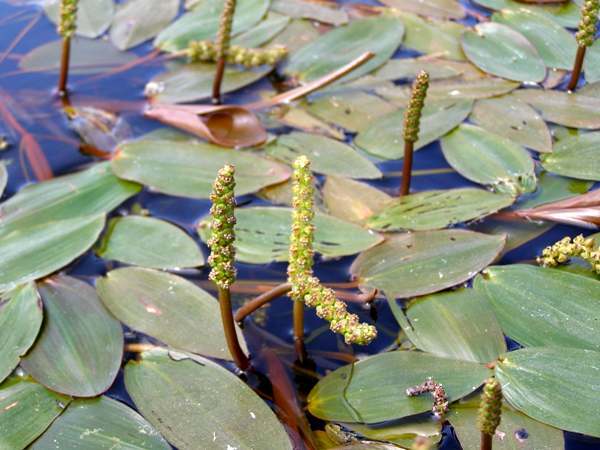 In summer you may see spikes of small green flowers which appear from May until September, but pondweeds generally spread via their root systems and so flowering is unnecessary for their continuity. There are several related species. They are all rather similar, although not all have floating leaves, and as hybrids also occur it can be difficult to ascertain exactly which species are present in an area. The photograph on this page was taken in West Wales.